Manufacturing of Jigs：Business Overview｜Hara Nukigata Inc.
Our company also manufactures jigs used for guiding the work to be done on parts produced by cutting dies. A jig is an apparatus that is used to improve work efficiency and positioning accuracy by securing the part in place so that it does not slip during the product forming process. In the past, when holes have to be drilled during mass production, jigs that allow holes to be drilled all at once by pinning down the part were often made. Recently, due to the shift in production to overseas production bases where labor costs are lower, demand for this type of jig has been dropping. Presently, there are many jigs used to ensure that the parts produced by cutting dies are piled up correctly layer by layer and one of these is the Patanko jig. This is a type of jig that allows parts produced by cutting dies to be positioned accurately by fixing the product base to the pedestal and putting on the guiding cap to match the axis. It is used for pasting the insulation tape when forming products such as mobile phones. As the type of jig used and how it is employed differs according to the product, it is custom-made in accordance with the needs of the customer. These two technologies are closely inter-related and sometimes both the cutting die and jig are ordered as a set. 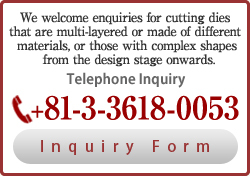 , we employ the state-of-the-art systems and skilled technology to produce a wide range of cutting dies that meet the various needs of customers, such as Victorian and Pinnacle dies, etc.